Designed and distributed by Kolstein Music, Inc. So what are the new Heritage Bass Strings all about? Three years of research and development with the highest attention to creating the first Perlon, synthetic core Bass String that offers the player the wonderful feel and tension of gut strings, but emulates the best arco and pizzicato tonal qualities of the finest steel orchestral or jazz string. 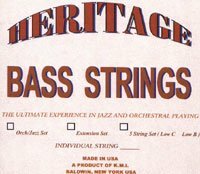 Heritage offers the first string of it’s type to not only afford the player the best in jazz quality playing, but remarkably does not roll under the bow…thus creating an arco/orchestral quality string that can be utilized under the most demanding bowing requirements. To play on Heritage Bass Strings is to experience the vast quality of this string.